Defying Gravity: A new interpretation of the flying tourbillon combined with a perpetual calendar. Martin Braun has very clear ideas. For him, the only possible choice for the watch was a flying – or cantilevered – tourbillon. For reasons both technical and aesthetic. 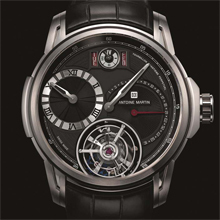 And meeting both these criteria is the single-minded ambition of the master watchmaker and his team. When designing the tourbillon, Antoine Martin's head of development – who is also well versed in theoretical matters – drew on all the experience amassed during the development of the escapement assembly for his perpetual calendar. And he has remained true to his philosophy of slowing time down. The tourbillon revolves around its own axis once a minute, while the escapement in the rotating cage ticks away steadily at 2.5 Hertz, or 18,000 beats per hour. This is a good deal more leisurely than the 28,800 beats per hour currently en vogue, but in no way less precise. On the contrary. Martin Braun chose silicium as the material for the pallet lever, escape wheel and impulse pin, and opted for a balance of nickel silver. Precision adjustment is achieved via the two half-round-head screws made of 18-carat gold, while the tourbillon cage is poised using two gold rings. 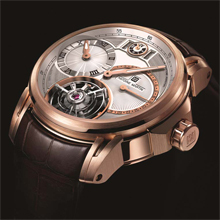 The result is a tourbillon consisting of precisely 65 parts and weighing a total of 0.62 grams. 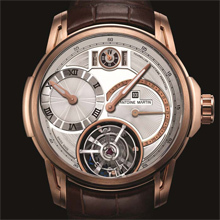 Not only that, the rotating cage has the breathtaking diameter of 14.1 millimetres. Which means there is no overlooking it. Another reason why the Antoine Martin tourbillon is difficult to miss is the fact that Martin Braun has positioned it so prominently under the glass. Between the tourbillon (which also serves as a small seconds) and the glass, there is just enough space to accommodate a slim minute hand. This necessitated a number of design modifications, and the end result is a regulator-like display. Minutes are shown by the large central hand, while the hour display is found in a selfcontained subdial. With this timepiece, Antoine Martin is launching the largest and most eye-catching tourbillon available; combined with the perpetual calendar, it is yet another masterpiece from the innovative young watch manufacturing company in central Switzerland.